BTW, if you need a King Kong t-shirt, I got one free one from the computer shop. Black t-shirt with white letterings and King Kong’s face. Match with the car. But two days ago, I decided to took it out from where we chucked it to have a look. Hmm…..it says Toshiba Qosmio AV Notebook PC. That laptop has the best of the best resolution. I drooled over it at several computer shops. It is almost like watching some very expensive TV. The colours, the crispiness etc etc. In case you do not know, it is Toshiba’s latest model. Costing +/- RM10K (USD2.5K). But wth will pay that kind of money for a notebook when they can get a huge TV, right? Take it all with you: DVD, DVR, TV, MP3s, games, mobile computing, 17â€ Ultimate TruBrite display. Enabled by impeccable Toshiba technology. So, I got a little vain. If I can’t afford the laptop, why not wear the T-shirt? Just like if I can’t afford a Ferrari, why not buy a Ferrari t-shirt? There I was, proudly wearing a t-shirt with the latest laptop brand plus a yet-to-be released movie icons. So, when you watch King Kong, remember the Queen! And fishtail, sorry no more t-shirt. The Queen Kong has claimed it! All hail the Queen Kong! Queen Kong, muahahahahah. I really dread the day Gordon starts to speak liao…. sakit perut dok gelak *lol*…. hahahaha!!!!! !why am i laughing? ‘cos i’m imagining the time when King Kong makes love to Queen Kong!!! Instant death sentence!!Hahahahaha!!!!! Dun call me stupid har…. 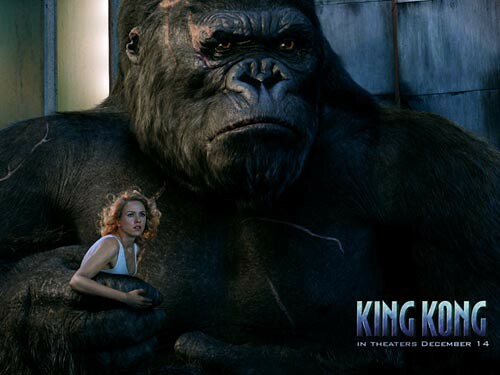 I swear to my hubby I will never ever (10X) watch a movie like King Kong!! Why?? Because I felt so sorry for the beast. Unless they change the ending where the beast gets to go back to the jungle and live happily ever after, I will not go watch!! The beast was happily minding his own business in the jungle and those blardy ppl go and catch him to make a quick buck!! I can’t face it!! Helen has got a point: why disturb a poor creature just minding its own business? But just wait: the next version of King Kong will have the beast climbing Petronas Twin Tower with its wife (each climb one). Then we’ll really see the real Queen Kong, haha! aaaggghghhhh! run away! run away! aaaggggghhrhrrhh! doubt it will ever come to m’sia otw they’ll make yea-mei out of kong…. but that notebook as heavy as a desktop woh…can carry or not? or put a trolley?